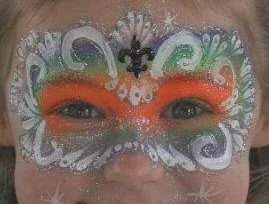 Lorie's Fantastik Faces provides Professional Facepainting and Glitter Tattoos for your parties and events on the Mississippi Gulf Coast areas (Pass Christian, Gulfport, Biloxi, D'Iberville, St. Martin, Ocean Springs, Pascagoula, Vancleave, Moss Point, Wade/Hurley, Escatawpa, Lucedale, Mobile, Grand Bay) I use only the best premium, cosmetic quality products, FDA compliant, and safe for use on skin. Great design portfolio for boys & girls (of all ages). Give them a birthday party they'll ALWAYS remember! What do you want to be? We provide quick, professional quality designs with a WOW-factor using professional, cosmetic quality products. 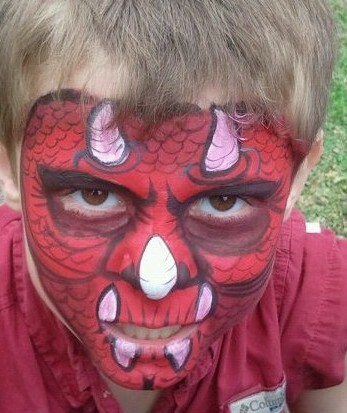 I'm a professional face painter using only quality FDA approved products located in South Mississippi on the Gulf Coast. For corporate events, I have a 10 x 10 EZ up tent, a self-contained kit that transforms into my table, one 3 x 4 folding table with fitted black tablecloth (used for glitter tattoos), multiple folding chairs, glitter tattoos are available with an additional artist at an additional price. We have a large portfolio offering a large assortment of designs at various prices. A professionally printed 2 x 8 foot vinyl face painting sign. I bring all my own equipment, paints, water. I do my own set up and take down, you are not charged for set up or take down. During the hottest months, an area inside with AC is preferred. Available for birthdays, reunions, "baby bump designs", parade faces, picnics, company events, etc. Call for birthday prices (1 and 1/2 hour minimum) Companies can hire me by the hour (3 hour minimum) and offer free face painting or you can allow me to set up at your business and provide face painting at a pay per face price at no expense to you. 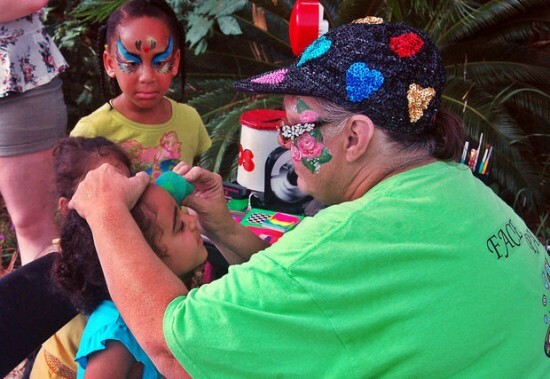 For larger events, an additional face painter or glitter tattoo artist is available (extra charge).